As you may remember – we’re not soon to forget! – Alex ruptured his eardrum back in May. The time I now call The Black Spring, with its strep and earaches and stomach flu. At the time, the pediatrician told us we shouldn’t get Alex’s ear wet, as there was a risk of water going into the inner ear and doing damage. So, dutifully, he’s kept his head out of the water since then. Well, last week, we brought him back to the pediatrician. “Wow!” he exclaimed on looking in Alex’s ear. “I wish you could see this! It’s a textbook example. You can see the clear window where the eardrum has started repairing itself.” Alex got the all-clear to submerge his head again, but he was warned to avoid jumping into water for the next few weeks. The pediatrician doesn’t want the force of impact to tear the eardrum again. As much as Seattle has complained of the 78 minutes of summer we’ve had so far, we’re getting the good weather when it counts: On the weekends. 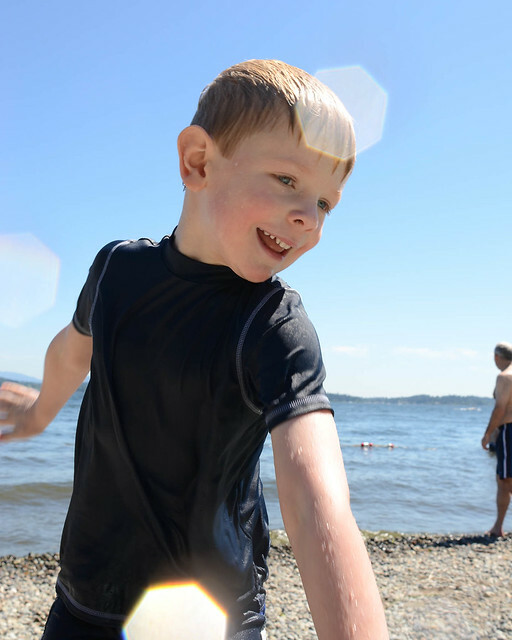 To celebrate Alex’s clean bill of health and the first sunny, warm day in a couple of weeks, we spent a few hours in the water at Magnuson Park. And this time, Alex happily got all wet!